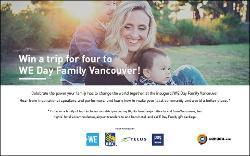 Prize: trip for 4 to Vancouver, BC to be taken between November 20, 2018 to November 22, 2018 which shall include:airfare two (2) nights hotel, iv) one (1) WE Day Family gift pack of assorted merchandise. Statistics: This contest was opened by 148 and entered by 28 ContestChest.com members. 19% of those who opened the contest, entered it.